At that time my Japanese skills were even worse off then they are now, especially when it came to reading. I tried several combinations of button mashing in a hopes to clean my clothes but ultimately failed in my attempts. I eventually had to put my clothes in the tub, fill it with water, add detergent, and go to town with my feet like I was a wine vineyard slave. I Had a fear of repeating this mode of cleaning in the future so I turned to my host mother to teach me how to use her washing machine. 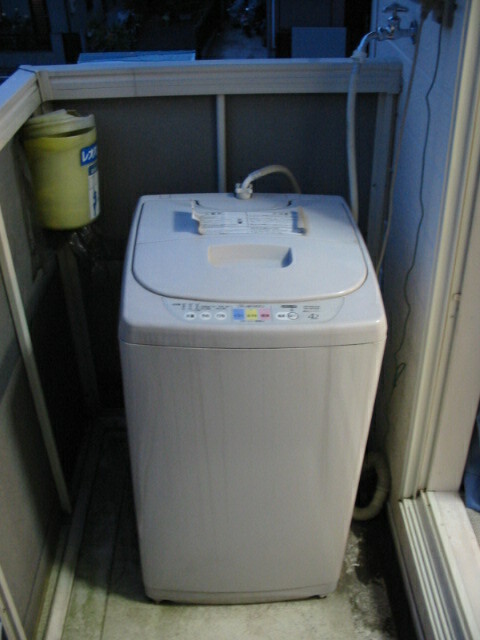 Now in Japan, it is very uncommon to use dryers. A family may have a dryer in the house, but from my understanding, it's only used for emergencies and not for everyday loads. The social norm here is to wash your clothes in the machine, then put it out to dry outside in the open air or inside in your room. 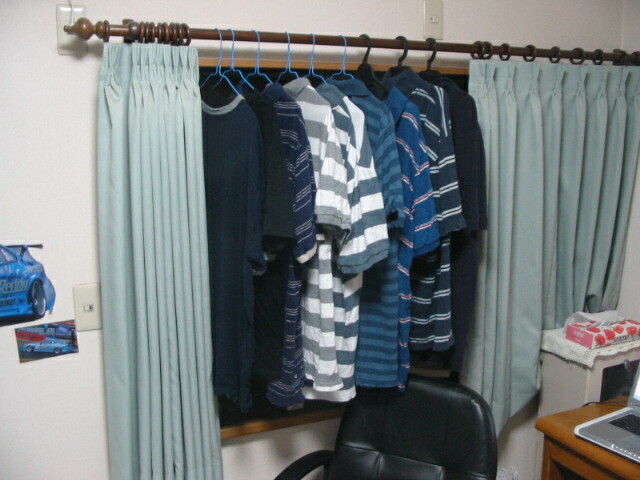 As you can see above, this is my first load of shirts put up to dry in my JDM room. I'm not quite sure how these are supposed to keep from wrinkling but I've been assured it won't happen. How? maybe something in the Japanese air, I'm not too sure (more likely I just misunderstood what she was saying when answering my question). 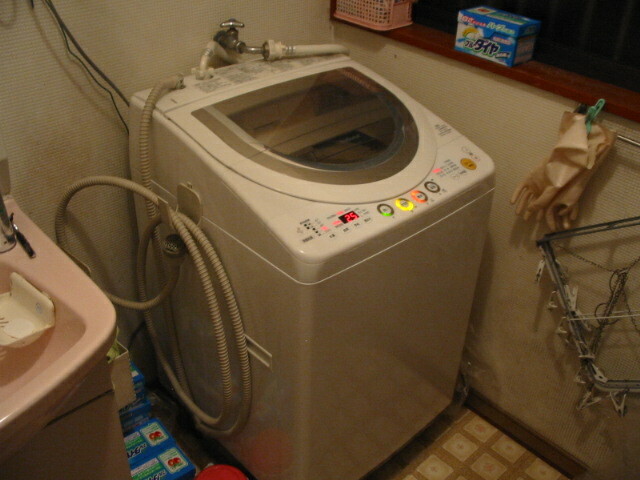 This is my current washing machine. As you can see, it's uber deluxe versus its POS predecessor. I guess from what she was telling me and what I was reading, it has an integrated dryer function which is available for use. 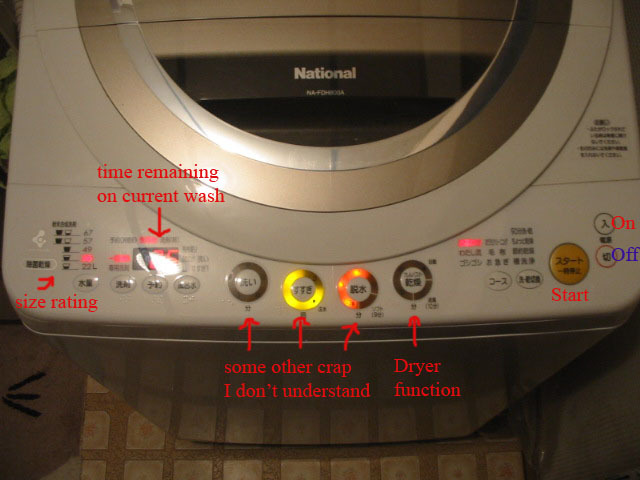 One specific cool function about these Japanese washing machines is it can tell how much of a load you've put in it, and adjust its levels accordingly. I simply pressed the on button, then start, and it felt out the load, then set it to the appropriate level and informed me on how much detergent to put in. Even though I was told air drying would be ok, I consulted the previous homestay student, who thankfully speaks in English, on ideas for keeping out the wrinkles. From his advice, I decided to use my room's space heater to blow warm air unto/onto my shirts and unmentionables. My space heater I thought ran off of hopes and dreams but earlier this evening my host mom pulled out this cannister of liquid type stuff from the port on the top. I asked her what it was but all I could get was a, "gasoline jyanai" (not gasoline). For now I'm going to guess it's magic Japanese fluid that flows from the rivers of mystery that so many other things come from in this country. 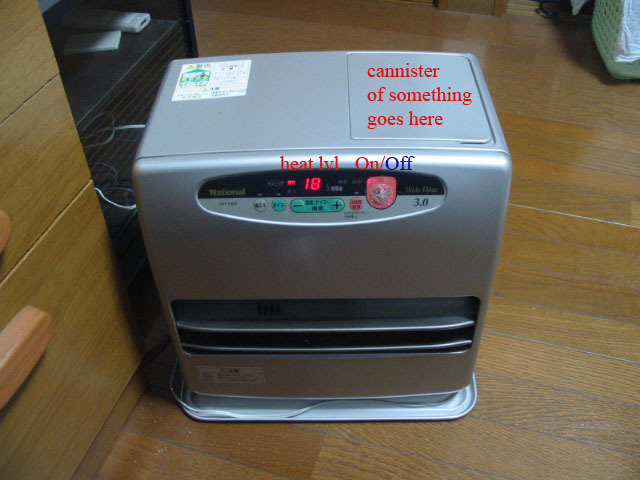 An interesting note I learned in regards to the heater though. I guess it's unusual for houses to use central heating and air unlike in the states. From what I was hearing, it's more normal to just use a space heater when occupying a room or communal area (such as the dining room). I think it has to do with their cultural norm of conserving energy. Lights in hallways also are on motion sensors instead of switches which turn off after about 10 seconds and everybody in the house always turns off their room's light even if they leave the room for only a moment. I'm adjusting the best I can to the air dying experience but I'm dreading the first day of wearing clothes without dryer sheet softners. Also, check back this Saturday (my sunday) cause I will be heading out to the 07' Tokyo Auto Salon and will be putting up a gallery similar to my 05' Tokyo Auto Salon gallery. It's sure to be packed full of JDM car goodness. Ballin! make sure you take plenty of pictures of corolla's for me. Have fun, wish i could be at the salon, but yeah well see ya n augustish. Your heater probably runs off kerosene like most of them do out here. I'll see you tomorrow at the Tokyo Auto Salon. It's been a few days since you last replied to my e-mail so hopefully you got it okay and we are still able to meet up. Very interesting stuff. I like your JDM room. I bet now you wished you listened to me when I was a light switching nazi and demanded the lights be off if even for 2 minutes while I was getting a soda in the other room! Man, keep these posts coming! They're pretty funny. I think they're extra funny because you can't really speak to many English speaking people so you can go all out on your vocabulary usage here, I love the way you describe things!